While in transit at the Hong Kong airport, we were hungry for decent-enough food as we landed at 5am. Even at this ungodly hour (for me anyway), travelers were already bustling about, rushing to departure gates, meandering through the few open shops, and queueing at Aji-sen Ramen! Slurping through a steamy bowl of noodles and gyoza soothes the cricks and twitches one develops after sitting mummy-like through the 12-hour transpacific flight. 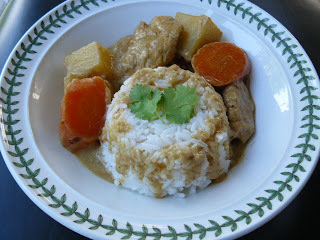 Oldest Son had the Japanese Curry Rice, and asked if I could replicate this when we got back home. After looking through a few recipes, here's my adapted version. 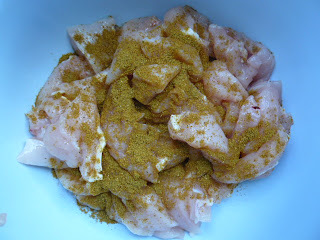 Marinate chicken in 1 teaspoon curry powder. Set aside. Saute onions in oil over medium low heat until golden brown, for about 30 minutes. The caramelized onions will help sweeten the dish when cooked. 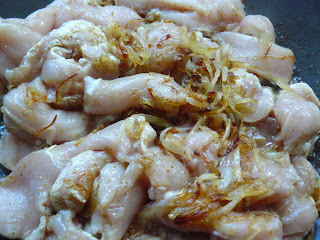 Turn up heat to high and add chicken pieces. Saute until browned. Add the carrots and potatoes, pour in water and bring to a boil. 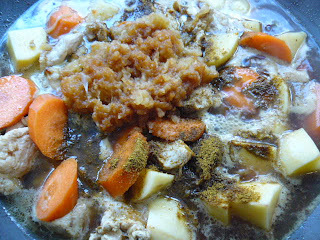 Lower the heat to medium and add the grated apple, salt and 2 tablespoons curry powder. Cover and simmer for about 30 minutes until potatoes are tender. Add ketchup and worcestershire sauce, pour in coconut cream and mix thoroughly. Let simmer for another 10 minutes. In the meantime dissolve 1 teaspoon cornstarch with a bit of water for the slurry. Add to sauce to thicken.